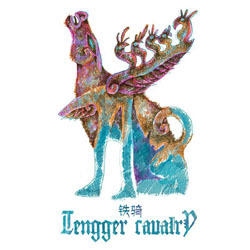 North Asian nomadic folk metal band Tengger Cavalry from China will release its third full length album on 1st of February 2014, via the American label Metal Hell Records. The new album is entitled “Ancient Call” and it expands the field of nomadic folk metal much more deeply. In this album, you will hear diverse kinds of North Asian folk instruments, including horse-head fiddle, dombra, guzheng, yangqin and different ethnic percussion instruments. “Ancient Call” retains the characters of both the brutal sound from the first album “Sunesu Cavalry” and the beautiful melodies from the second album “The Expedition” and adds more epic elements into the 10 new songs. New soundtracks involve more of orchestral instrumentation to enhance the epic atmosphere of the nomadic legend. Each song, as the name of the album hints, is an ancient call to honor the great nomadic culture and the ancient landscape. You will hear both of the toughness of Tengger Cavalry and the great beauty of the grassland. This album is a great sound shock for those who enjoy the great pagan power of ancient nature!